Happy Easter from all of us at Team Egg Cave! Our annual Easter Egg Hunt is back in 2019! We've hidden 30 Easter eggs around the site for you to find. When you see one, click it to claim it. When you find all 30, you'll receive this year's Easter Egg Hunt prize... a brand-new species called the Zomini and 4 spring-themed Travels. Visit the Easter Egg Hunt HQ to get started. The Easter Egg Hunt will be open today through April 30 at 11:59 PM ECT. Last year, we made big changes to how the Easter Egg Hunt worked. The biggest change was that the site will not display to you eggs that you've already found (kind of helpful, huh?!). This year, it's mostly the same. Like last year, eggs do become progressively more difficult to find as you find more. For example, the last 5 eggs are much more difficult to find than the first 5 eggs. Don't expect to find all 30 in one sitting... it may take some time! Rest assured, you have more than one week to find them all and receive your prize. There isn't any special advantage to completing the hunt faster, so enjoy the ride! Easter eggs are hidden in different places for each user, so there isn't any use in sharing where you found them with others. Their locations and links are unique to your account and are completely randomized. You are permitted to find Easter Eggs on any of your main and side accounts; however, you are only allowed to claim your Easter Egg Hunt prize on your main account. Abusing multiple accounts to get multiple Zomini creatures is not allowed. Instead of creating trinkets for monthly creatures, we're creating more for older creatures that have been around. Here's the latest batch! Our favorite might just be Bunny Ears (Dragfer Stage 2). Who would have thought a dragon would wear bunny ears?! Find all of these restocking at Trinket Travels. Congratulations to @lendulka and @ananik and @sharkyyy, the winners of drawing 1 for April 2019's Cash Shop Creature Lottery! A Floodeer has been added to each of your accounts. These fresh spring coffees are now restocking at the Bean Sack. Our annual Easter Egg Hunt returns around Easter. Who's ready?! The Wackalama has retired from the Cave and is now available in the Cash Shop through April 30 (the end of the month) for 200 CC. Couldn't collect enough? There's still a chance. These music-themed Cash Shop Travels are retiring on April 9 at the end of the day. Get yours before they're gone. Try saying "Wackalama Piñata" five times, fast! These new piñatas are now restocking at the Toy Shop. Get yours today! APRIL FOOLS!!! Egg Cave is not becoming to Eggnite. We are not transitioning to a battle royale game. Creatures cannot be killed by other users. It's a joke! The Egg Cave that you all know and love is here to stay. Even though April Fools is over, we couldn't resist continuing the Eggnite joke though. Say hello to the Wackalama, the egg that you can actually whack with a stick to make it hatch (without doing any harm)! 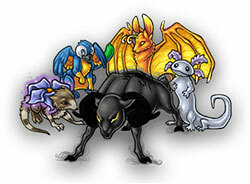 This creature will be available in the Cave through April 7 and then become a Cash Shop creature. In preparation for Easter, these Easter-themed Travels have arrived in the Cash Shop for a limited time.